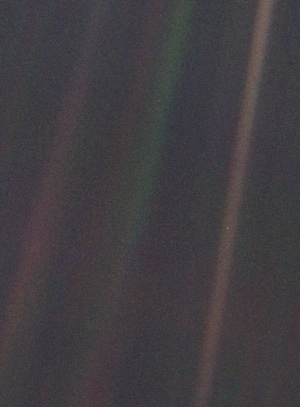 The image above the Pale Blue Dot earth is a bright pixel when photographed from Voyager 1 six billion kilometers out (beyond Pluto). Carl Sagan (November 9, 1934(b) – December 20, 1996(d)) the renowned American astronomer, cosmologist, astrophysicist, astrobiologist, author, science popularizer, and science communicator in astronomy and other natural sciences encouraged NASA to generate this image. These are the words from Carl Sagan, Cornell University lecture in 1994 regarding the Pale Blue Dot otherwise known as Earth.